Welcome to Elderwriters Creative Personal Legacy Writing! a. to expand the options for personal legacy writing beyond the traditional memoir and autobiography. b. to provide motivations, encouragement, and support for that writing. Until now, personal legacy writing has been limited to the autobiography, the memoir, and occasionally, the ethical will. Few people leave behind one of those literary forms. Treasured family stories, fond memories, and individual philosophies are lost to future generations because we do not routinely compile a written legacy. What a shame. Personal legacy writing should be part of everyone’s later years. It’s time for a new paradigm. I’ve got just the thing – the Personal Legacy Document. A personal legacy document is a collection of original and/or otherwise authored writings that reflect your thoughts and feeling about what life has meant to you. It is a gift to give to friends, family, and future generations. You don’t have to be an experienced writer to create a rich trove of short pieces that reflect your thoughts and feelings about what life has meant to you. In the Elderwriters approach we explore a wide range of forms – anecdotes, epiphanies, paragraphs and poems, lessons learned, one-liners, lists, essays, letters, and more – to help you collect your thoughts and celebrate your life. There is nothing in the approach that requires or anticipates writing skills beyond those learned in high school. PLDs average twenty to twenty five pages. 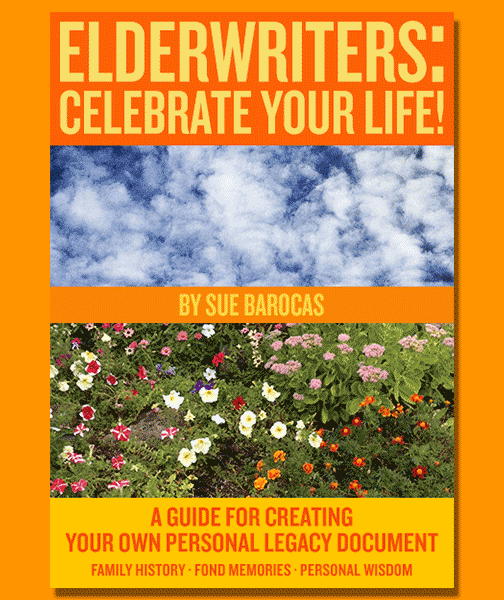 Elderwriters: Celebrate Your Life! is a guide for creating your own personal legacy document (PLD). It is written as if you were going to work with me week by week. The chapters are sequenced to take you from the beginning stages of personal legacy writing through the printing and preserving of your document. If you follow the prompts and complete the exercises, you will have your own PLD by the end of Chapter 13. Presenting the material as a curriculum not only makes the process more manageable for the individual, but also provides an easy transition for those who wish to facilitate a class or small group. So what are you waiting for? Celebrate your life! • This course was a treasure allowing me to get my thoughts on paper. • What a gift you have given us. • I so much appreciate your time and experience in getting me started on writing and compiling my Legacy Document. • Learning about short pieces, poems, lists has been the greatest way to start writing. • Fabulous course – motivating, inspirational, relaxed, fun. • This was one of the best OASIS courses I’ve ever taken. Posted by 31d3r at 5:21 pm on May 13th, 2013.